The Chinese believe that pears double boiled (ceramic pot inside a pot) with rock sugar and served cold will balance the body's heat and soothe the throat. All I remember about my mom's double-boiled pears was that they were a special treat and they took hours to cook. I was at Four Seasons Restaurant recently and dessert that evening was pears poached in red wine with caramel custard, very delicious. That led me to poaching pears at home last Friday and I am just so happy I did that because now I know that poaching pears (or any other bland-tasting fruit) is so easy to do. Even Wey loved the poached pears and told me I must blog about them. taste in the poaching syrup but am not sure if it was the wine or my suspicious mind. Because wine is acidic and the pears are poached for about 50 minutes, it would be better to poach the pears in a glass pot. You can add either cinnamon or star anise or both spices (I used cinnamon only and my kitchen smelt like Christmas) and orange or lemon peel, or both peels. I used three types of pears. Chinese sweet pears, one of my favorites, forelle pears from South Africa and the common Barlett pears. I found that after poaching, all pears tasted alike: soft. So it really doesn't matter much what pears you use. I think. But when it comes to pears, Chinese ones beat the western ones hands down, to a pulp. Chinese pears are very sweet, crisp-crunchy and less dense than western pears. 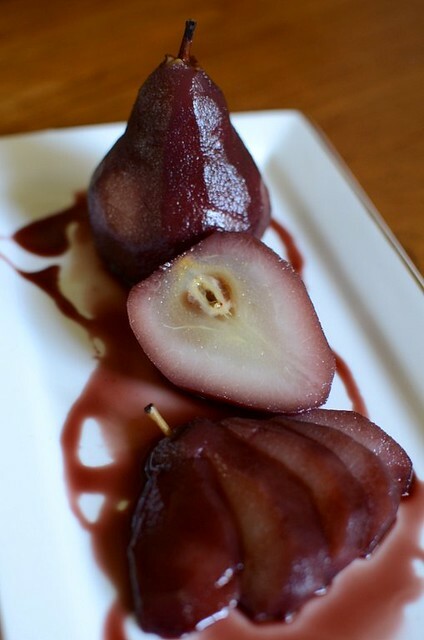 So eat Chinese pears au naturel and poach the bland-tasting western pears. 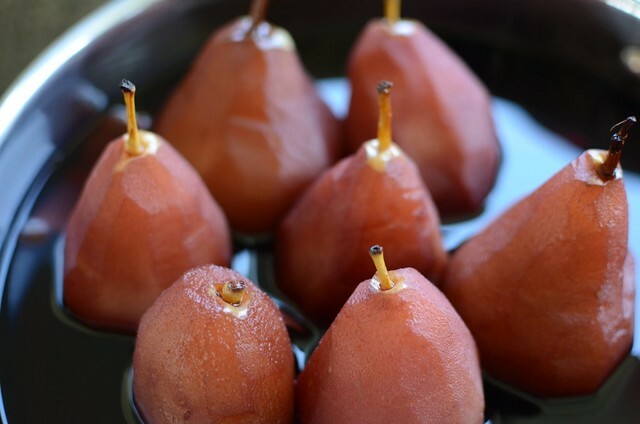 Poached pears can keep for up to a week in the fridge so this is a dessert that you can prepare well ahead. 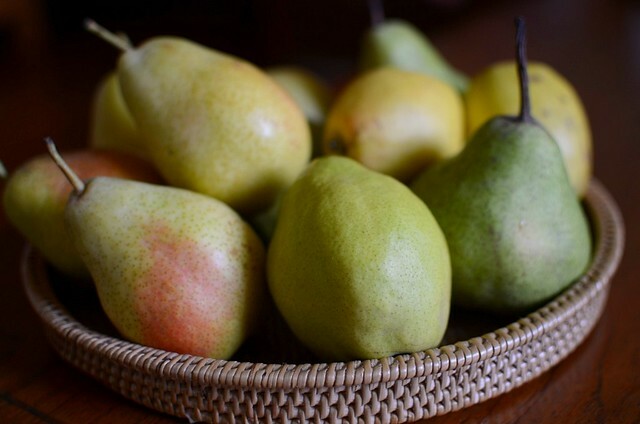 And if you really don't have time to make anything else to go with the pears, just serve them with a good vanilla ice cream (or gelato--they are less sweet than ice cream, which is why I'll take gelato over ice cream anytime). Your guests'll be impressed but the truth is, poached pears are probably the easiest dessert to make. 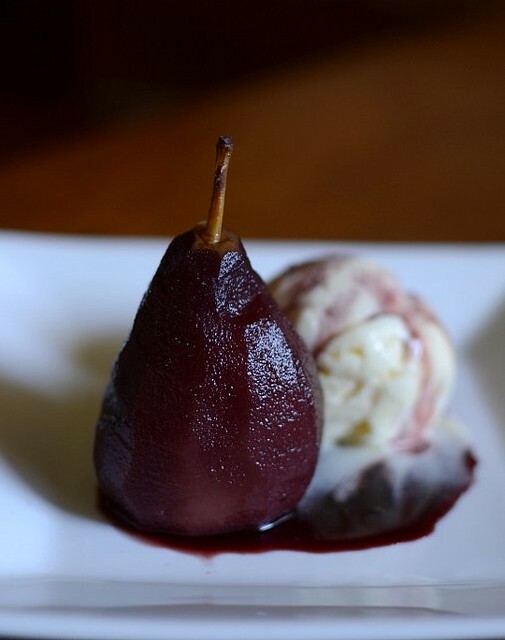 Our favorite way to eat poached pears? Plain, with plenty of the delicious poaching syrup. And chilled, very chilled. Learn from my mistake: use a smaller pot so that the pears are completely immersed in wine. And use a glass pot because it's non-reactive with the wine. 1. Peel the pears, making sure the cut surfaces are nice and smooth. Do not cut off the stems. Cut the bottom of the pears so that they can sit upright. 2. Put the rest of the ingredients except the pears into a glass pot and boil for about 5 to 10 minutes. 3. Add the pears to the poaching liquid, standing them upright. When the liquid comes to a boil, lower the heat to a simmer and cover. If pears are not fully immersed in the poaching liquid, turn them over once in a while to make sure they get evenly colored. Simmer for about 50 minutes or until pears are soft. Remove into another bowl, immersing them in the wine. Let cool. Cover and chill. To thicken the syrup, put about 1/2 cup or more of the poaching liquid into a small pot and boil under high heat until the liquid is syrupy. Cool. Use that to drizzle over the pears and ice cream or cake you are serving the pears with. You can also serve the pears in the poaching syrup. Wey and I love them that way, no ice cream or cake to mess with the flavors. Just make sure the pears and syrup are very chilled. The alcohol content of the wine will not be strong after boiling and the sweetened liquid takes on the scent of the cinnamon and orange peel. Truly heavenly. seh moh!!! everytime come into your blog, I am entice to make what you have posted! How lydis?? Hehehe..
Never eat this before, but it sound so good. Terri, I had sent an email to your daughter last week but there is no reply till now, maybe she taught it was a spam email. Could you help to inform her. Thanks a lot. an awesome classic that is so easy to make. once again, Simplicity Is Elegance. sauterne is also a good wine to use as well as barsac. if you want to really knock 'em dead (and forget the simplicity aspect) make a pan of bananas foster and serve them side by side with some vanilla ice cream in the center. the contrast of flavors, plus the hot and cold, make for a good mix. terri, please delete the redundant post, my connection hung-up. hey.. where's the four seasons restaurant ah? denise: it's next to coffee bean in damai! never been there? the japanese food is good. jackie: poaching it in wine n with rock sugar is totally different. wow look like straight from a food magazine. looks gorgeous. never try poaching pear before...maybe will try for christmas dessert. i love this dessert and thought i might share some info. i first had this is germany where it was called "birnen de helene" which roughly translates to helene's pears, and its a recipe originating from france. i made it myself before, but i didn't totally immerse it. instead i cut the base of the pears and sat it in the pot, resulting in a pretty 2 tone half poached pear. note that the poached portion will end up softer then the unpoached portion so it might be worth using not too firm pears so as to withstand the poaching. gregwee: oh do try it and yes, it would be great for christmas! we prefer to eat them very cold in the poaching liquid, no ice cream.